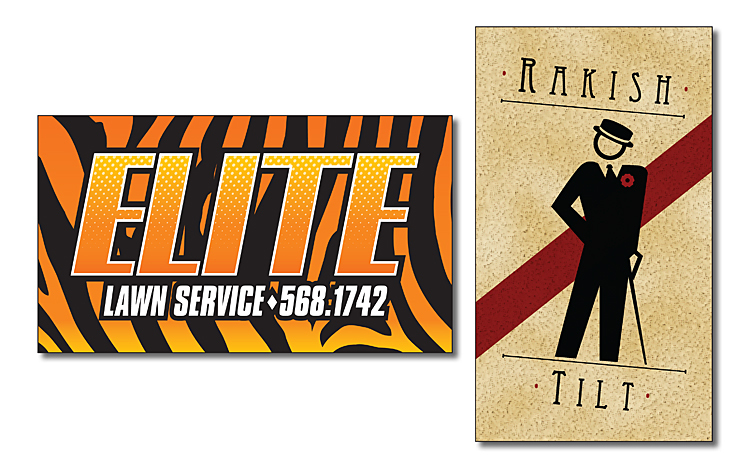 Our high quality full color business cards are all printed on premium card stock. We offer three different card stocks to meet most customer needs. Free aqueous coating is standard on all full color cards. Free UV coating is available upon request which will give your cards a very high gloss professional look (not available on matte finish cards). Business cards are trimmed to a standard finished size of 3.5" x 2". We use a guillotine cutter, not a card slitter. This assures a smooth polished edge. Most orders ship in 3 business days and ship FedEx 2-day at no additional charge. Our business card prices below are based on our staff providing a basic one-color or full color layout. This includes a customer supplier digital logo, basic contact info and tag line. Business cards are printed in 2-3 days and shipped FedEx 2-day, so generally an order placed on Monday is received on Friday. If you are a business owner needing cards for many staff members, we have special corporate programs for you. Give us a call. If you are providing a ready-to-print file, please call us for a price lower that those listed below. We have over 20 different types of business card stock. Please call us for more info. Our Graphics Department will be happy to design your business cards for a nominal fee. Typically a full color business card design is $25-$50 depending on complexity. Future modifications (name, address, phone, etc.) are made at no charge. If you have questions concerning the proper way to format your files, please refer to our instructions here or give us a call at 1.866.LOGO.LOGO. Note: Coated business cards are sometime difficult to write on with a pen. If you need to have your business cards printed on an uncoated matte card stock we suggest the 100# Accent Opaque or the 12pt C1S which is uncoated on the back side. Please call us if you have any questions. Other card stocks and special shapes are available. Please call us at 1.866.LOGO.LOGO to discuss your needs. The process of causing the ink to raise on business cards is called thermography. While this process was extremely popular years ago, the labor and energy intensive process has caused prices to rise making them more expensive that full color business cards. There are a number of different card stocks available. If you have a need for raised ink business cards please call us to discuss your specifications. Place your business card order today by calling us at 1.866.LOGO.LOGO.